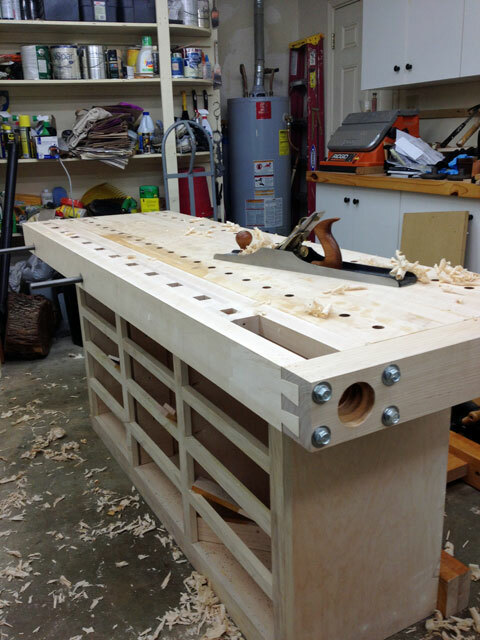 Our August 2014 Workbench comes to us from Len R. from San Antonio in the great State of Texas. 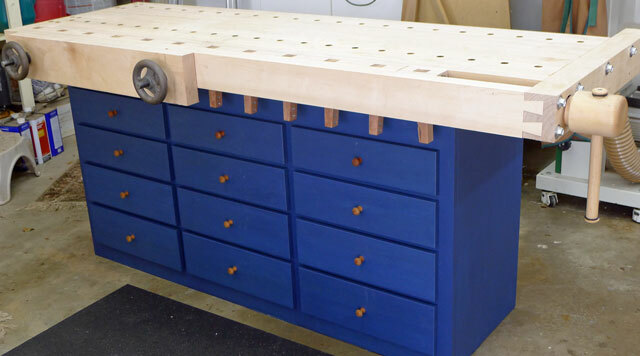 He has modified his previous Roubo workbench into a fantastic Shaker conversion. In addition to the completed workbench photo, he has also provided some in-process shots to show you how he made this happen. Enjoy! Hi, I am submitting my conversion to shaker style workbench for your workbench contest. 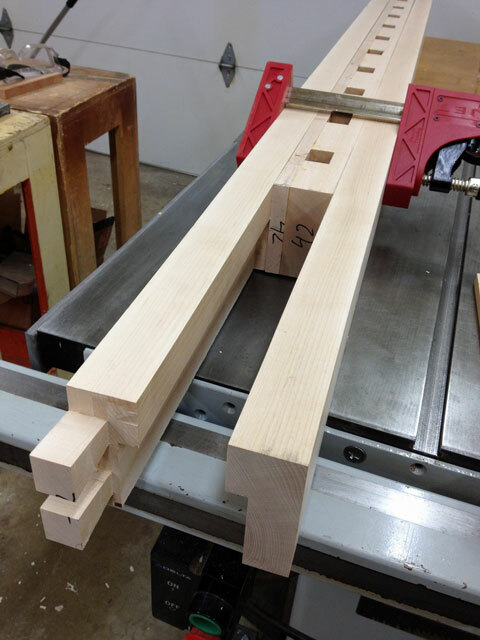 For several years my workbench started its life as a Roubo-style workbench. I purchased the Lake Erie Wagon vise during the October 2013 WIA wood show in Cincinnati. 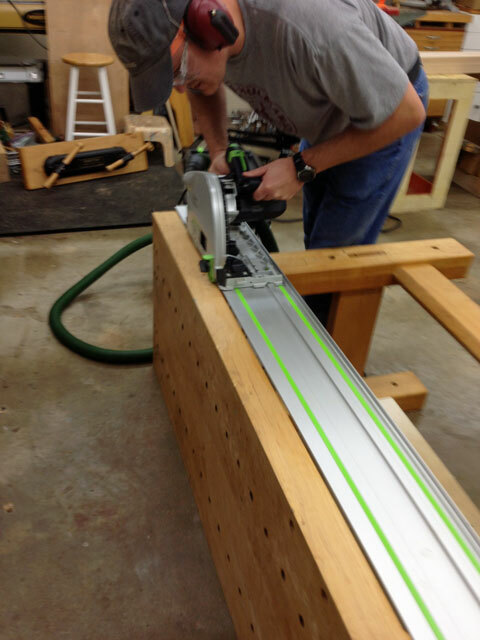 After my retirement in February 2014, my son assisted in the Roubo to Shaker workbench conversion. My workshop is in the garage where my wife’s car also spends each night. The need to maximize the storage and use all available space led to the redesign of the old bench to a new Shaker-Style bench with the Lake Erie Wagon Wheel vise and 12 drawers below. I kept the old Roubo-bench top and added a new 6-inch cantilevered front section to incorporate the new Lake Erie Wagon Vise, and I added 12 square wooden dogs. The top is hard maple with a 6-inch wide new front section and rest of top is from the old bench. The new cabinet has a popular front, plywood box, and full-length drawer slides with drawers of 120 hand-cut dovetails. The maple top is 4 inches thick for the new vise section, and 3 inches thick for rest of the top. It is overall 76 inches long. The 12 drawers provide storage and are set below the level of the dogs. The base is finished with milk-paint to match a “Grandpa’s Workshop” sign. A Moxon vise was also incorporated in the front-section of bench. 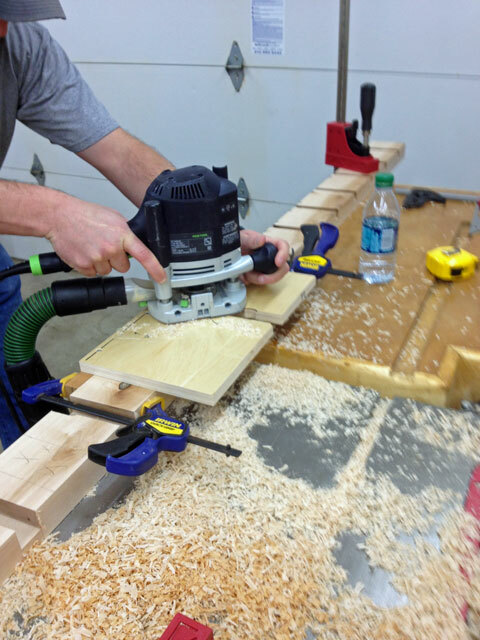 The Lake Erie wood-vise screw is great with its rapid action, and it stays tight in use. I have used the vise for 3 months and for building the workbench drawers. I use this vise more than others. I lined the opening and the wooden dogs with suede leather to hold boards for using hand planes. Thanks for the show and great work on the wagon wheel vise parts.